It is a little known fact that some of the best beer in the world – certainly outside of the Holy Brewing Trinity of Belgium, Germany and the UK (with a special mention to the US, where California in particular is crushing it) – is actually to be found in the wild depths of Patagonia. At least, that was the conclusion of Prawns for Breakfast after spending many hours, ahem, seriously researching the subject across the most southerly parts of Chile and Argentina. So let us take you on a very merry little jaunt around some of our favourite independent breweries and bars in the region, many of them with defiantly German roots. Prost! 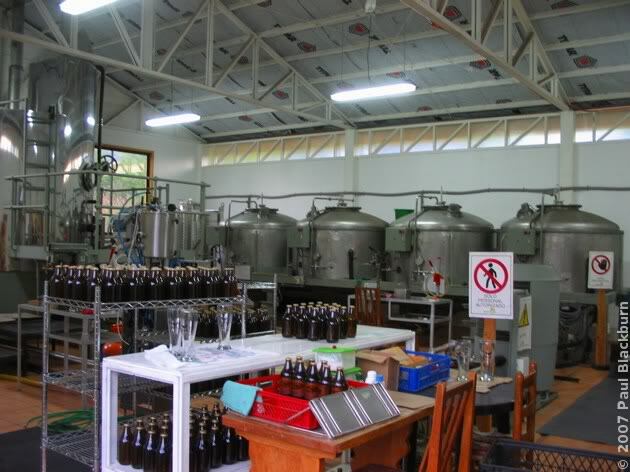 We really enjoyed a quick tour and a couple of pints at Baguales, partly because they were upstanding folks with an evident passion for keeping their craft local, but also because we had missed out on the opportunity to arrange a tour of the more famous Austral brewery (see below) when had been in Punta Arenas. Baguales beer is undoubtedly the real deal in craft brewing: it has won a coveted bronze award in the prestigious Latin American cup for craft beers (in which another of our favourites on this trip, Bogotá Beer Company, also won silver), yet currently produces only two ales – pale and dark. There are currently no plans to sell their product in the shops, and expansion plans are limited to wanting to open a second pub in Puerto Natales,”if things work out here”. They were happy to show us around the (tiny) on-site microbrewery for free and without a reservation, and afterwards gave us a taster flight of both beers so we could choose our poison. In the end they were both exceptional, so Clare ordered the stout-like, chocolately dark ale and I the hoppy, lively pale one, and we swapped half way. Whilst not cheap compared to other Chilean beers, they were both standout options for a lazy Sunday afternoon, which is strange as Baguales chooses to close Sundays. Ah, Austral, la cerveza el mas austral del mundo, as the brewery proudly refers to its offspring. Whilst we were disappointed not to get time to take a tour of the southernmost beermeister in the world (its name means ‘southerly’), we did get to taste its wares in plenty of places on the Patagonian leg of our trip, and it’s fair to say that it satisfied every time. With a typically Germanic origin, Austral’s beer is popular throughout Southern Chile, although bizarrely less so in its capital than imported lagers like Heineken and Stella. The lager’s zippy, bubbly and yet still full-bodied taste makes it a perfect after-work, or in the case of this image, after-trek beer, especially with a plate of chips, or bag of roasted nuts. Austral also makes pale and dark ales as well as (like Kuntsmann, below) a blueberry-flavoured beer. Having worked up the thirst for a jar or two at the end of a long day’s trekking in El Chaltén, we duly checked out this cosy little pub and microbrewery just opposite our hostel on San Martin. We were glad we had decided to cook for ourselves later that night because the famed pizzas being ordered by our neighbours were a sad, soggy sight, and clearly not baked, or perhaps even topped on the premises. We ordered the only beer available on tap: a light, cloudy ale, which boasted a proper head of foam and looked set to deliver the goods. There was a great deal of guff going on in the beautifully rendered menu about unfiltered beer being the best because it means all the goodness of the brewing process is left in. This may be so, but somehow the brewmaster had conspired to remove all the pizzazz instead. What we were left with was an initially gratifying citrus hit followed by a dull, uninspired aftertaste and a whole heap of popcorn, which was very quickly demolished by two hungry trekkers. D’olbeck was yet another small, family-run brewery that got away, simply because they are located some way out of Coyhaique and no public transport connects to the brewery from the town. Nevertheless we got to sample this finely crafted pilsner whilst staying in Chile Chico for a couple of days before we caught the ferry to Puerto Ibanez. A bar on the town’s main drag was pouring pints of D’olbeck and serving them up with lomitos, the epic Chilean snack that makes a perfect partner for beer from the barrel. The bottle design was cheerfully retro and nodded to its Germanic history. We drank our beers on the balcony overlooking the sleepy little port town in the late afternoon sun, and concluded that this was possibly the only way to enjoy this beer’s fruity, mellow taste to its fullest. We first discovered Kuntsmann in Castro on the island of Chiloe, where it was being sold by the pitcher in a German-influenced schop house overlooking the main square. The place was defiantly old-school, boasting rows of wooden tables throughout the middle of the pub, glass-partitioned booths around the walls and a huge, ornate beer pump at the bar. Payment was taken at a cubicled caja (cash desk) at the front of the establishment, rather than by the waiter or at the bar. The food, as befitted a Chilean bar, looked bland and unappetising, but the beer was the beginning of a love-affair. We plumped for their undeniable champion brew, Torobayo. A pitcher of this malty, amber beer cost CHP$4,900 (US$8.50), which is about a third less than tourist destinations like Pucon were getting away with charging for it. Groups could also order Kuntsmann there by the columna (literally, a column of ale, like the English yard), which was an impressive if faintly overwhelming sight. By the time we had got to the shabby-chic university town of Valdivia, a few hours south of tourist favourites Pucón and Villarica, we were pretty excited about the heady conclusion to our o-beer-view of Patagonia: a tasting trip to the famed Kuntsmann Brewery. Valdivia has been synonymous with a Teutonic way of life since the mass arrival of German immigrants in the mid-nineteenth century, and from then on has carefully cultivated a proud drinking culture, manifested today in a thriving bar and restaurant scene, populated by trendy thirty-somethings and punk-rock loving students alike. The Kuntsmann brewery even sponsors Valdivia’s answer to Oktoberfest each year, where the town’s best drinkers are coronated and celebrated by thirsty burghs. The pretty guia flashed a winning smile at us as she took us through each stage of the production process, explaining that Kuntsmann beer is renowned for the purity of its ingredients, including the finest German hops and the crystal clear Valdivian spring water that cascades through the surrounding mountainside. (In an ironic twist, they sell beer brewed with these imported hops back to the Germans, by changing the brand to ‘Patagonia’.) It was a shame that guests couldn’t get inside the bowels of the brewery to see the rows of stainless steel casks up close, and in truth – even though the tour was in Spanish – we could tell that it was long on history and short on production detail. But it was a fascinating glimpse into the way a European drinking culture flourished so far from home, and despite numerous set-backs including the destruction of the original brewery in the Valdivian earthquake of 1960, created a brand that became synonymous with artisan Chilean brewing. At the end of the tour, we were able to swig a foamy, unfiltered pint of Torobayo straight from the tank in the only section of the brewing floor we were allowed into, even if it took a while for our tenacious guide to pull enough froth off the tap to let the ruby-red liquid settle. Afterwards in the beer hall out front, we took on the tasting sampler of all Kuntsmann’s beers, with and without filtration. They included a light, golden weissbier, blueberry and honey-flavoured fruit beers (which we reckon would compliment starters of smoked salmon or goats cheese), a dark bock with the aroma of toasted coffee, and of course the signature Torobayo and its deadly sister, Gran Torobayo, weighing in at a hefty 7.5% ABV. We even got a free sample of their latest creation, an even darker version of the bock, which unfortunately tasted a bit like drinking Guinness out of an ash tray. It was the only one of the 11 types of craft beer we tried that sunny afternoon that we didn’t warm to. But the clear favourite was that deep amber, almost caramely Torobayo – a perfect partner for a plate of smoked cheeses and crudos (the local speciality – open face raw meat sandwiches). Here’s to craft beer (in the words of Homer Simpson): the cause of – and solution to – all life’s problems. Pressure on: would the beer deliver?